Two-hundred-and-fifty-six regular-season games played. Ten tense play-off games chalked off. Just one to go – Super Bowl XLVI at the Lucas Oil Stadium in Indianapolis. What better way to end the season than a rematch of Super Bowl XLII between the New England Patriots and the New York Giants? With an estimated 110 million people watching worldwide, who will come out on top in the biggest sporting spectacle of them all and walk away with the Vince Lombardi Trophy? Our resident NFL junkies have their say. Sean Held argues the case for the Giants, while Tom Jackson is picking the Patriots to prevail. Sean Held: The NFL is an unforgiving workplace, with no position scrutinised more than quarterback. Eli Manning has had to work harder than most to gain universal recognition, but has finally arrived as an elite quarterback this season – his eighth in the league. The naysayers, in the goldfish bowl that is New York City, have finally been silenced. The Big Apple is the hardest market in America to convince; you only have to ask the New York Jets quarterback Mark Sanchez – a man almost permanently under siege. But Manning has the city abuzz as we enter Super Bowl week. To borrow from New York’s favourite son, Frank Sinatra: he is currently king of the hill, head of the heap and ready to secure his second championship ring. It has been the do-or-die, almost claustrophobic, atmosphere of the play-offs where Manning has made his name. His poise and production was near-perfect as he led his Giants team to thrilling victories over the defending Super Bowl champions, the Green Bay Packers, and the ultra-physical San Francisco 49ers. Manning now has an NFL record of five play-off road wins. The Giants playmaker looks in complete control of his offence and is perfectly primed to dissect a suspect Patriots secondary. Tom Jackson: It has supposedly been the season of the quarterback and there is no better way to end the year than having two of the league’s best, Tom Brady and Manning, go head to head. Brady has been at his usual best all year, though has been somewhat overlooked, thanks to the record-setting Drew Brees of the New Orleans Saints and the Packers’ MVP-in-waiting Aaron Rodgers. But, make no mistake, “Tom Terrific” has put the Patriots in Indianapolis. More than 5,000 passing yards and 39 touchdowns is a magnificent year for any quarterback, and no-one would begrudge Brady standing on the podium with the Vince Lombardi Trophy in his mitts on Sunday evening. SH: Manning has always lived in the shadow of his elder brother, Peyton. The Indianapolis Colts legend is one of the most complete quarterbacks to ever enter a huddle. Baby brother Eli may not be blessed with Peyton’s freakish ability to read coverage and marshal a game, but a second Super Bowl triumph would spark a legitimate legacy debate. Peyton, a four-time league MVP, ravaged by injury and pondering a move away from the Colts if he regains fitness, has only won one Super Bowl. Eli is just four quarters away from gaining family bragging rights. Father Archie, a Pro Bowl quarterback himself, lacks the resumé to enter this particular quarrel. TJ: Throughout the noughties, the discussion had been who the game’s greatest quarterback is: Peyton Manning or Tom Brady? That conversation categorically ends on Sunday. Victory for Brady would be that much sweeter if the Patriots’ star man ended the argument in the house that Peyton effectively built. Once the 60 minutes is over, Brady can look at this game being the icing on the cake of an undoubted Hall of Fame career. Victory would see him equal the great Joe Montana and Terry Bradshaw’s record of four Super Bowl rings. At 35, Peyton Manning will never come close to emulating those achievements. SH: Though the previous Super Bowl meeting between these two great ball clubs has long since passed, the mental scars are still there. Brady admits he cannot bear to watch the video tape of that heartbreaking defeat. The Giants are the last team the Patriots wanted to see representing the NFC at the “big dance”, despite the Packers and Saints having superior, more dynamic offences. Brady had arguably his worst game of the season in week nine, turning the ball over four times, as New York came from behind to defeat New England 24-20. The momentum and the psychological advantage is undoubtedly with the Giants. TJ: In public, both Brady and the Patriots’ head coach, Bill Belichick, will distance themselves from that 2007-08 Super Bowl defeat and simply cast it aside as unimportant in relation to this year’s showpiece game. But behind closed doors, it will be a totally different story – this really is a “Revenge Bowl”. That last-minute defeat hurt the franchise a lot: to go 18-0 and fail to walk away with the championship title was a hammer blow – something that has taken New England a long time to come to terms with. Here is their shot at redemption. Brady and Belichick’s demons will be exorcised with victory. SH: While it is nigh-on impossible to match the phenomenal credentials of Belichick, Tom Coughlin has his own set of coaching attributes that have helped propel his Giants to another astonishing post-season run. Preparation and attention to detail are key themes for Coughlin, a notoriously strict disciplinarian, who enforces a rigid dress code and insists players turn up at least five minutes early for team meetings. The Giants cussedness is inherited directly from their red-faced head-honcho. Mistake-free football is the name of the game and Coughlin’s troops get the message. The Giants are the mirror image of their old-school coach – testy, tactically sound and tough as teak. Belichick and his staff will have to draw up the game plan of their lives if they are to outfox the 65-year-old. TJ: If you are interested in an NFL game that turns into a game of chess, then you only need to watch the placid Belichick. He is the mastermind who remains unemotional and seemingly detached, even as he manipulates everything from under his trademark hoodie – almost drawing comparisons with a Dark Lord of the Sith from Star Wars. What cannot be questioned, though, is Belichick’s record. Only the great Tom Landry (five) and Don Shula (six) have won more conference championships in the Super Bowl era than Belichik. Don’t expect much from the 59-year-old in the lead-up to the game. He has only one focus and that is to ensure his team are fully prepared for Sunday night. It’s just his nature to be impassive, but he is always in total control. SH: The two best slot receivers in the NFL, Victor Cruz and Wes Welker, are bound to feature with regularity in Indianapolis. Welker led the league in receptions and Cruz has emerged as a cult hero in New York. However, I expect Hakeem Nicks to be the Giants’ big threat down the field. The current Patriots defence are more fragile than a Ming dynasty vase, without the mystique or the history of excellence. Nicks, a former first-round pick, has 280 receiving yards in his two play-off outings to date, and could end up eyeing Air Miles and not air yards when he comes face to face with New England’s struggling cornerbacks. The Giants’ running game is sluggish – any group that retains the services of Brandon Jacobs loses the right to be taken too seriously. However, Nicks will be a factor and is a potential MVP, if he can shake off a niggling shoulder injury. TJ: 2011 has ultimately been about the birth of the modern-age, athletic tight end. New England possess two of the league’s best, a real two-headed monster in the form of Aaron Hernandez and Rob Gronkowski. “Gronkowski has the numbers, but Hernandez runs routes just as well as any tight end in the game,” cornerback Champ Bailey commented after the Patriots dismantled the Denver Broncos 45-10 in their AFC divisional play-off meeting. Each will pose different problems to the Giants’ defence – Hernandez is the quicker, more agile of the two and has put up wide receiver-type numbers in a bumper year that saw the Gator catch 79 balls for 910 yards and seven touchdowns, while rushing for 61 yards on five carries against the Broncos. Gronkowski, meanwhile, had a season that few believed was possible for someone playing at tight end. He posted single-season records for tight ends for most receiving touchdowns (17), most total touchdowns (18) and most receiving yards (1,327), all set in 2011. One of these two players is bound to show up big in Indianapolis. SH: In their past two games with Brady, both victories for New York, the Giants’ defence held him to a 59 per cent rate of completion, sacked him seven times, had two interceptions and conceded just three touchdowns. The Giants’ pass-rushers clearly know how to rile Brady, who loves to pierce the middle of the field and target his freakish tight ends and Welker. A healthy Justin Tuck and, arguably this year’s most impressive defensive end, Jason Pierre-Paul, will be gunning for the Patriots’ big-shot. Pierre-Paul has been relentless, recording 16.5 regular season sacks and 86 tackles. I just cannot see Brady evading his grasp long enough to steer his team to victory. TJ: In truth, the Patriots aren’t a championship-winning defensive unit. In the regular season, they ranked 31st in total defence, giving up, on average, 411 yards per game. Like the Saints (24th in league) and Packers (32nd) found out in the play-offs, eventually a porous defence will catch up with you. Yet it seems that the Patriots have found a way to get stingy at the right time of the year – throughout the play-offs, they are only giving up roughly 4.6 yards per play (second behind the Houston Texans). Opponents have accordingly had to be more patient and wait for their opportunities against Belichick’s men. Up front, led by the beast Vince Wilfork, the Patriots will have no worries. Their concern will be trying to hide Julian Edelman, who will have to occasionally play in nickel or dime situations, against the talented Giants wide-receiving core. SH: Order has been restored after a season of offensive wizardry from an ever-expanding cast of star quarterbacks. Make no mistake, defence wins titles and the Giants are the best outfit still standing. I predict more heartache for Belichick, a former defensive co-ordinator and special teams coach for the Giants, at the hands of his first NFL love. TJ: There’s no doubt that this is a mouth-watering tie and a fitting way to decide the 2011-12 season. The week nine match-up has already proven that these two teams are evenly matched. New York will feel that they have Brady’s number, but the quarterback is clearly on a mission to etch his name in the history books. This game will boil down to the Patriots’ offensive line against the Giants’ hungry pass rush. There is no way that New England will shut the likes of Pierre-Paul down, but if they can limit the damage to no more than three sacks, then Brady will just out-duel Manning in a last-minute thriller. If I can stay awake Sunday night I might give NFL another go. It dazzles me but I am just learning the game. Tom, what are nickel and dime situations? After reading this preview I will be backing the Patriots, can’t beat a bit of revenge can you? It becomes a nickel defense when you take out a lineman and add a secondary player, i.e. 5 secondary players on the field. And dime is where there are 6 secondary defenders on the field. As a UK NFL nut it was a pleasure finding this preview. The Eli section was very , very clever in terms of wording. Great to see top level writing on my sport and on my doorstep. 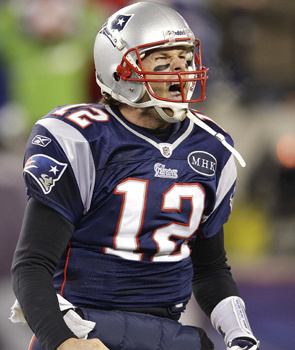 Tom, I agree with you, Pats to win. I like Edelman though, a talent who might step up on D as well as special teams. I also think Matt Light and his O line might control this hyped pass rush. Your take on Light’s chances Tom? Thanks for the kind comments Mark. Edelman has talent and fits Belichick’s versatility box. However he will get torched if he plays in the slot, which I think is more likely. The Pats will play the safety over the top to help protect him but I think Cruz and Manningham are better route runners than people give them credit for. I expect the O-line to play well and they use Solder as an extra lineman on occasions. Also expect to see Gronk/Hernandez used as “chip-blockers” as well. But the thing is the Giants have used 27 different combos in their front 4 during the playoffs alone – at some stage they are going to create some match-up problems. Brady can take some sacks, ditto Eli. Picks neither can afford. picks. I think Sean Held was harsh on the Giants running backs. Jacobs and Bradshaw can be dangerous. Do you concur with Sean or do you fear the G~Men if they run the rock? I’m sure Sean can chime in but I think Bradshaw is the danger; Jacobs is very very average (at best). After the season Eli has had the Giants don’t need to run the rock to be threatening – though establishing it will help. The greatest show on Earth. The craziest game on turf. Eli shows his worth. Willfork has huge girth. Brady class from birth. Hard hits no mirth. Pass the coffee, Miller Lite and the pretzels. SuperBowl!!! I think Peyton Manning has a superior skill set to Brady and hasn’t had the chance to work with Belichik the greatest coach in history, so comparisons are tough to make. Tom I really enjoyed the article and cant split these two teams tonight. There more I look at it the more I like the matchups the Giants have, they beat them in Foxboro in November and that was without Bradshaw, Nicks or Beckum playing a part. In 24 hours Eli could have 2 SB rings & still be the worst Manning !! Surely a guy leading a team to two Super Bowl wins cannot be worse than his brother? Individuals in team sports a toughie though. That David Villa is a better soccer player. Indivvidual sports like golf and tennis you can judge. With team sports I say the debate never ends. Sean Held got it pretty much spot on, even got close to the final score. Eli just has the midas 4th quarter touch. And coach Coughlin has Belichik’s number. Booked my Wembley tickets today, shame we won’t be seeing the Super Bowl champs, but will see Brady who was great on Sunday and blameless for the loss. Eli just got it done and had the luck with him. Nice…..Great content, caught it late but summed up the night for me..